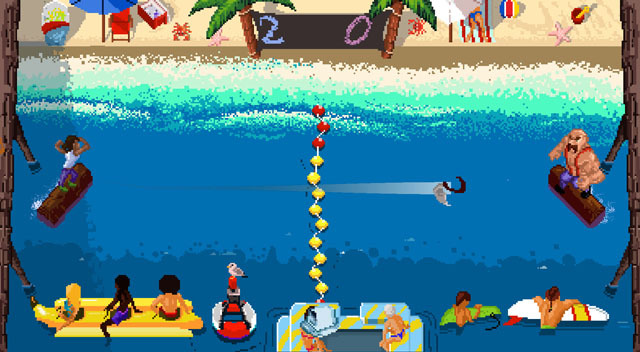 Log Jammers, from Mega Cat Studios, is a modern retro take on the alternative sports game Windjammers, which came to arcades and the Neo Geo in the mid-90's... and as such, was filled with musclebound beach people bursting with 90's 'tude. Log Jammers (no relation to the Lebowski-verse's Logjammin') eschews the 'tude in favor of wacky over-the-top character designs, featuring an equal mix of human and nonhuman characters in a world filled with logging and political corruption. Instead of running around an arena, opponents are logrollers, running and spinning their logs along the water (or lava, or mayonnaise) as they toss hatchets back and forth at one another. Players can toss the hatchet in a straight line or bounce it off the edges of the arena, and the goal has a 2-point center and 5-point edges, offering additional strategy and keeping the pace up, as either player can make a comeback in 11-point matches. The game is coming to PC, Mac, Linux, PS4, and Xbox One in February of 2019. Check our coverage here.